The exhibition starts on Monday afternoon and ends on Thursday. During my booth duty, many people came by, either knowing JSC already and having a quick chat about the latest development, or just browsing around the floor and becoming interested in our facilities. Also outside JSC’s booth, the exhibits floor is super busy. Like on a medieval marketplace, the who is who of supercomputing shouts for attention. Everyone is presenting their latest products or introducing to their new technology. When walking through the aisles and absorbing all the information and impressions you can easily get exhausted mentally. Mitigating this stall in processing are the various give-aways across almost all booths. JSC’s German2 gummy bears are an infamous and gladly taken offering from over the Atlantic. Beyond the exhibits floor, the actual conference takes place. And this is the second part in which members of JSC are involved. The conference has different parts: It hosts workshops and tutorials, it has a large technical program (which includes talks of submitted and accepted papers, a poster session, invited talks, panels, and casual Birds-of-a-Feather session3 (BOFs), awards prices, and invites to keynotes and panels on a really huge stage. From Jülich, researchers organized workshops and tutorials, presented their papers, participated in BOFs, and were even on the large stage speaking to thousands of the attendees. Together with my colleague Jiri Kraus4 and other colleagues from Oak Ridge National Laboratory and IBM, we hosted a tutorial on Monday. 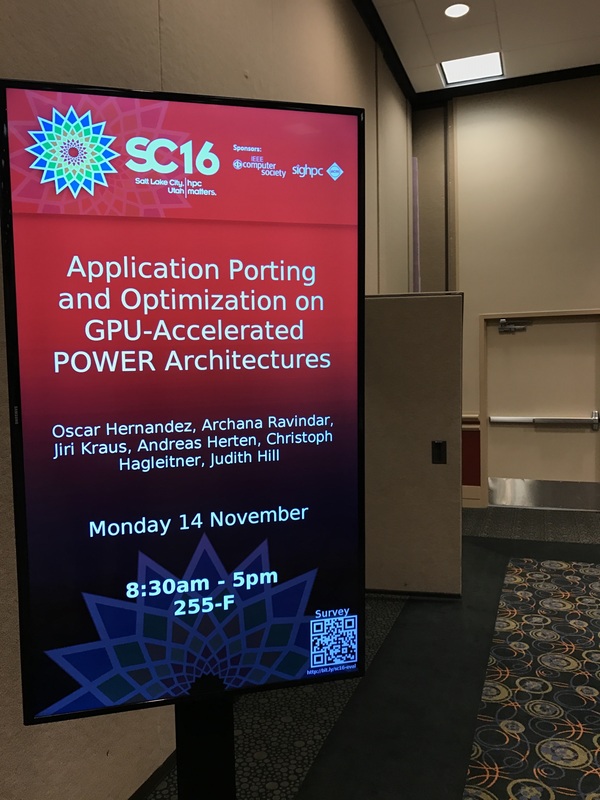 The title: Application porting and optimization on GPU-accelerated POWER architectures. That’s full of buzzwords, so let me paraphrase that for you: Creating programs and lowering their runtime on those new IBM CPUs (POWER8NVL) which have a super fast interconnect to those new NVIDIA GPUs (Tesla P100). In the course of six talks and three hand-ons we tried to give the attendees of the tutorial an overview of what the new architectures are (the POWER8NVL has some new parts, the P100 is really new), how one would measure and increase an application’s performance, and how an actual real-life application can benefit from the setup. It was a lot of fun! People were quite interested and worked hard on the coding examples. We actually worked on a small supercomputer located in Jülich (JURON), since the architecture we presented is so new and only few systems are already available. Even though all data packets had to cross over the Atlantic twice, everything worked out alright. The hard work before the tutorial was absolutely worth it. Judging from the evaluation, also the participants liked it a lot. 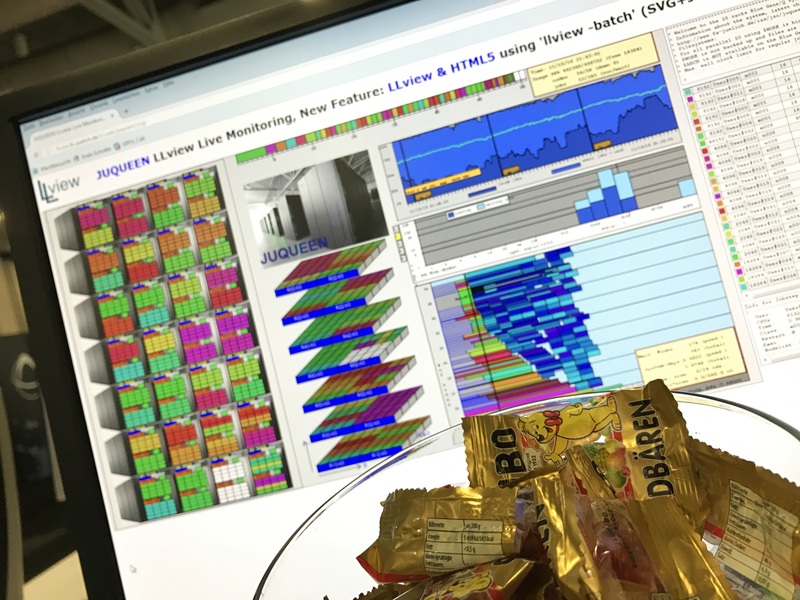 Apart from our tutorial, there were other tutorials (on visualization, debugging, performance measurement), a workshop on I/O, a paper on I/O measurements, and parts of a BOF with or by researchers from Jülich. Really a lot of participation! 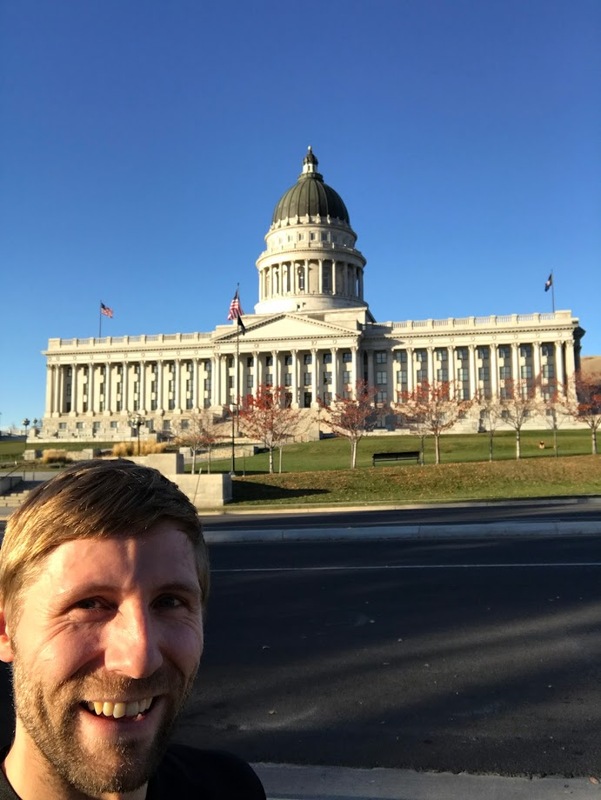 The last part of the conference actually happens outside of any structured program. And for many it is probably the most important part: During one week, all players in the supercomputing game come together in one place. So, many of them meet up in various occasions to discuss past, present, and future projects. Especially such an international area that is supercomputing can be accelerated greatly when everyone is on-site and can meet-up away from keyboard. For example, I attended a formation meeting of an OpenACC user group; OpenACC is a programming model we use in projects and teach in courses. Being together with like-minded people was really motivating. Further up I wrote that Jülich staff also spoke on the main stage of SC16. What’s up with this? 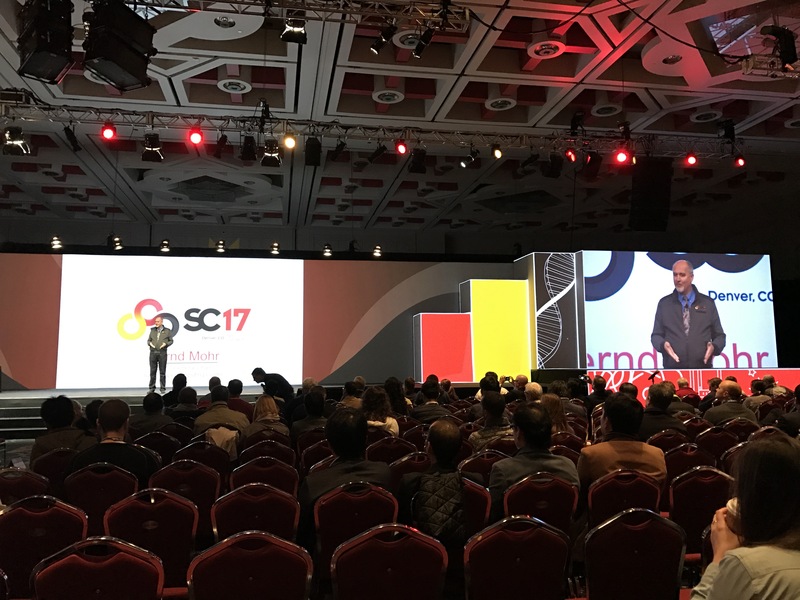 Speaking was Bernd Mohr, who introduced the next Supercomputing in 2017 in Denver, CO. As a first Non-American, he is going to be the Supercomputing’s General Chair next year! Quite an achievement! He has a blog here in Jülich’s blog portal in which he also reports of the preparation process. Let’s see what we can bring to the table next year. Maybe a new tutorial on other GPU-accelerated systems? A booth will be at the exhibits floor for sure (and I hear it’s going to be all new and shiny)! I very much look forward to the next Supercomputing and hope I can attend again. Dr. Andreas Herten is a Post-Doc at the Jülich Supercomputing Centre. He researches in accelerating scientific applications with graphics processing units (GPUs).